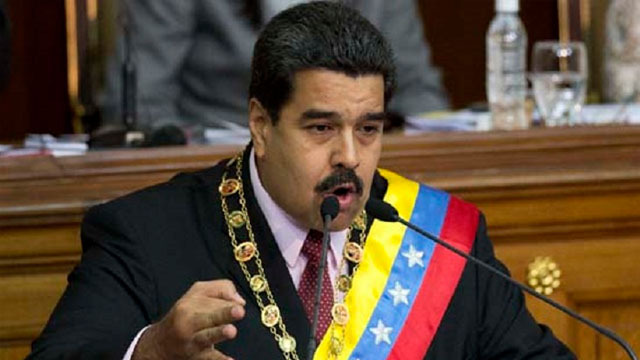 MADRID, Spain (AFP) — Venezuela’s President Nicolas Maduro flatly rejected yesterday a call by European countries to call snap elections after Opposition Leader Juan Guaido declared himself the Latin American country’s interim leader. Guaido, already recognised by the United States, Canada, Australia and several Latin American countries, said yesterday he would lobby the European Union for badly needed humanitarian aid to a nation wracked by economic crisis. Guaido was also expected to announce a date for the arrival of humanitarian aid from the US — a path Maduro believes will lead to a US-led military intervention. In Washington, US President Donald Trump warned that military intervention remains “an option” for dealing with the crisis in oil-rich Venezuela. Canadian Prime Minister Justin Trudeau meanwhile held a phone call yesterday with Guaido, commending him for his “courage and leadership” and underscoring his call for fresh elections, according to a statement. Tens of thousands of people turned out Saturday for competing shows of support for Guaido, and for Maduro, who was sworn in January 10 to a disputed second six-year term.